We had to make so many decisions when we built our new construction home. I didn’t realize it at the time (having never built a home before), but perhaps our most important decision-making centered around the HVAC system. Propane is very expensive—at least a third more than natural gas—so most people in the area opt for electric heat pumps. 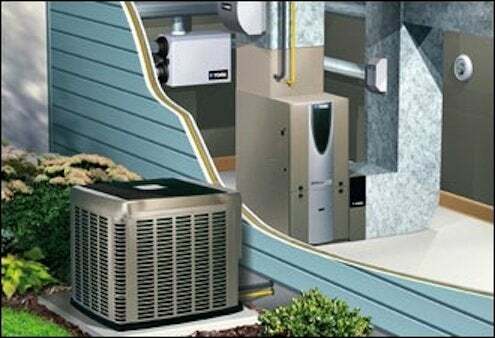 The only problem is that electric heat pumps do not work efficiently once the temperature drops below 40 degrees Fahrenheit. We don’t live in a frigid climate, but we do get cold weather. And our experience living in rentals with electric heat pumps wasn’t entirely favorable. So we opted for a hybrid heat pump system—a dual fuel, dual fan-speed unit from Amana. We now get the best of what electric and propane can offer. When it’s above 40 degrees (the temperature threshold is programmable), our furnace uses the electric heat pump to warm our home. And when it drops down below 40, the alternative propane portion of the unit kicks in to do the heating. During our home planning phase, we estimated this hybrid heat pump system would save us $1,200 to $1,500 a year in fuel costs over a conventional propane gas-only furnace. That’s a big deal! Related: Is It Time to Replace Your Furnace? In addition to the dual fuel option, we also went with a dual fan system. When it’s relatively mild, and the house only needs to warm up by 10 or 15 degrees, the furnace conserves energy by using the lower fan speed. When it’s really frigid, the higher speed setting kicks in to get the warm air moving faster to where it needs to go. – What are the fuel options available in your area, and what are the markets like for those fuels? Are they relatively stable or can there be great fluctuations in cost? 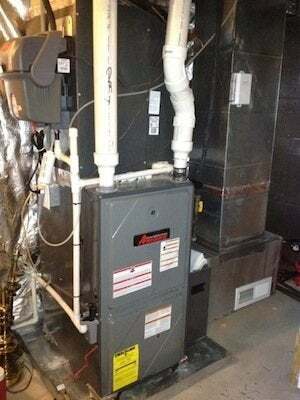 What’s the best way to hedge against that when choosing a furnace? – What is the climate like where you live? Are the winters mild or harsh? How hard will this furnace likely need to work? – How much will your fuel costs likely be? Can you save money with a hybrid system? If so, how long will it take to pay for itself, and do you plan to stay in your home that long? Hybrid heat pump systems are more expensive than traditional systems but can pay for themselves in three to five years—or less, as in our case. And I was pleased to find out during a recent appraisal of our house that a hybrid heat pump system actually adds value to a home. When choosing an HVAC system, it is definitely worth the effort to get out your calculator and do some research. The time you spend planning up front can really pay off in the long run.